Audi says the new A7's rear tapers like on a yacht. FRANKFURT -- Audi has picked the Detroit auto show in January for the debut of its latest-generation A7. Audi has given the coupe-like sedan a fresh, muscular exterior design, cleaner interior and technology including remote garage parking and 48-volt mild hybrid technology to improve fuel economy. Audi launched the A7 in 2010 with fastback styling that shared similarities to Audi 100 S Coupe from 1970, one of the first cars that helped launch the brand on its path toward premium brand status. 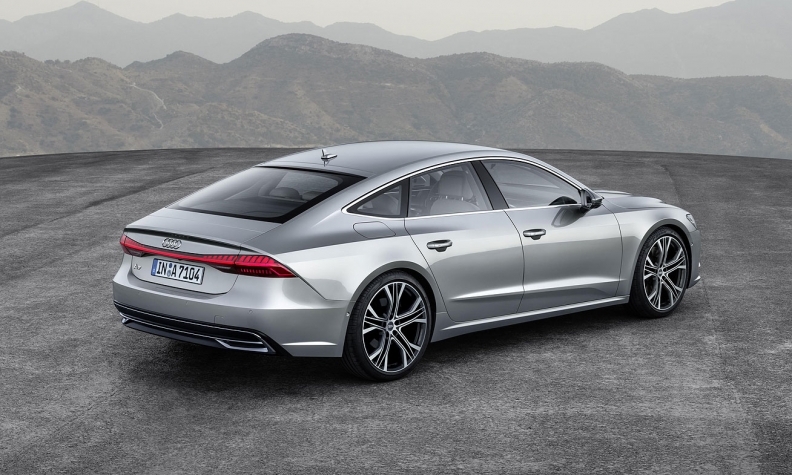 The new, second-generation A7 will go on sale in Europe in February, with prices starting at 67,800 euros in Germany. A date for the U.S. launch has yet to be announced, but it is expected sometime toward the end of the year. "The A7 is the brand’s sporty face in the full-size class," an Audi spokesman said. "The new model delivers on the promise of the Prologue design concept we showed in Los Angeles in 2014." Global sales of the A7 Sportback fell just over 40 percent in the first nine-months to 12,800 cars ahead of its run out. Previously however, deliveries to customers had been stable at close to 30,000 units on an annual basis and last year it outsold the A8 sedan for the first time. U.S. sales of the A7 declined by 25 percent to 3,439 through September, according to the Automotive News Data Center. In Europe, the sedan's volume fell to 4,748 from 7,245 in the first eight months, the latest numbers available, according to JATO Dynamics. The A7 is built in Audi’s plant in Neckarsulm, Germany.